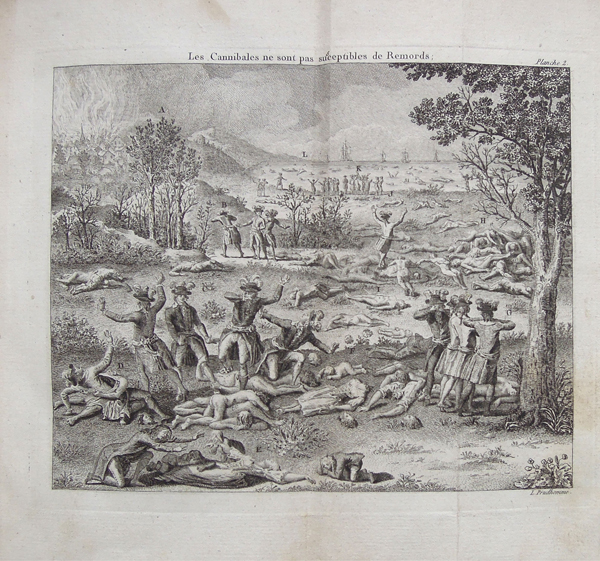 In Paris there were two further components to the allegations that human skins were being tanned for leather. Firstly, the charge of wearing trousers or boots made from human hide was extended from the generals in the Vendée to their civilian colleagues in the Convention. Secondly there were persistent rumours, whether spontaneous or orchestrated, that a secret tannery had been set up at Meudon with the express purpose of processing human leather to equip the soldiers of the Republic. Here we can afford to be more robust in our conclusions - there is no real evidence; it was all just nonsense, most of it malicious. After Thermidor, it was an obvious strategy to associate the Jacobins in the Convention with military excesses by charging them with having worn clothing made from the skins of victims of the Terror. According to Jean-Clément Martin, besides Barère, Vadier et Saint-Just, those implicated at one time or another included Billaud-Varenne, Drouet, Foussedoire, Javogues, Le Bas and Moulin (Un détail inutile, p. 61 et p. 144, note 103). The accusation was persistent and dogged surviving deputies for years to come. It is difficult to pinpoint exact origins; the only written sources date from Restoration. In later accounts the accusation is usually loosely associated with speculation concerning the tannery at Meudon. According to the journalist Prudhomme, one of the earliest and most quoted authorities, on the occasion of the Festival of the Supreme Being, 20 prairial Year II (8th June 1794), the deputies wore their new ceremonial costume of "royal blue coats, with buckskin breeches"; but "several were dressed in breeches made of human skin, like those sent to Barère by a general in the Vendée". Prudhomme was a bitter opponent of the Terror and offers nothing to substantiate his observation. It should also be noted that this passage does not come from Prudhomme's contemporary writings but from his Histoire impartiale which was only published in 1824. A young woman, tall and shapely, had refused Saint-Just's advances; he had her taken to the scaffold. After the execution he wanted to have the corpse shown to him and the skin removed. When this vile outrage had been committed, he had the skin prepared by an oil tanner and wore it as breeches. I heard this revolting fact from the actual person charged with these preparations, the man who actually satisfied the monster. He told me further details that I do not care to repeat, in my office in the Committee of General Security in the presence of two other people who are still living. Jean-Baptiste Harmand de la Meuse was Saint-Just's colleague in the National Convention in 1792-94, but the anecdote does not belong to his original work of 1814; it appeared only in the posthumous edition of 1820 which contained twelve new chapters "suppressed by the original censor". Clearly by a different hand, the additions were a literary embellishment designed to make the work more sensationalist. Neither the name of the woman nor a definite date is given. Later in the same section the author stretches his credibility by insisting that Revolutionaries produced oil from human corpses, which was sold for enamellers' lamps. Anne Quenneday, president of the Association pour la sauvegarde de la Maison de Saint-Just was so indignant that she was driven to quote the inventory from the sale of Saint-Just's personal effects in Year III: his wardrobe contained no human skin, just a blue cloth coat, and two pairs of breeches, one in buckskin ("en peau de daim"), and the other again in blue cloth. In November 1793 the Convention founded an establishment for munitions production and research in the former château at Meudon. It was controlled by a Commission of prominent scientists, engineers and military experts, who included such worthies as the chemists Fourcroy, Berthollet and Guyton de Morveau and the mathematician Claude Chappe, inventor of the optical telegraph. The work - concerning gunpowder,cartridges, incendiary devices, aerostatics and such like - took place in strict military secrecy and there were large numbers of mysterious comings and goings, mostly the transport of munitions towards the frontier. I can neither confirm or deny it... but I can tell you what everyone believed... that at Meudon the locals showed with strange terror the windows of the lower room of the old château where they claimed that horrible "manipulations" took place; each night they heard the rumbling of covered waggons, which brought the decapitated bodies of the executed from the place de la Revolution to feed the tannery. Unsurprisingly, the records of the Convention do not yield any corroboration. After Thermidor, some initial concerns were raised about security at Meudon; Barras proposed to the Committee of Public Safety that two Representatives be sent to investigate but his proposal was not adopted; Barère produced a report, calming fears and pointing out need for military secrecy. 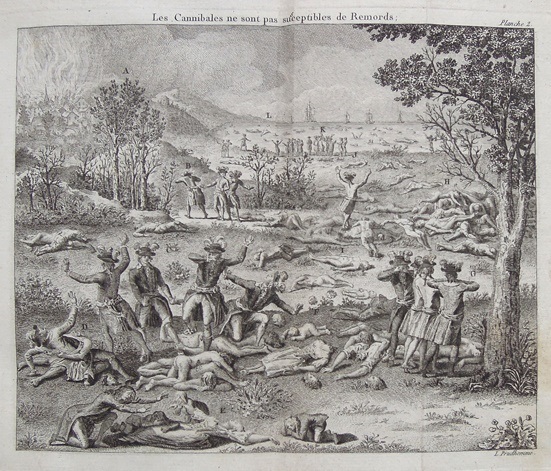 The Thermidoreans Bentabolle and Fréron exploited the establishment as a weapon to discredit the Terrorists; Fréron in particular presented it as the centre of vast plot against public liberty - but he made no reference to any illicit tannery. Nor is there any mention in the denunciations or indictment of Billaud, Collot, Vadier and Barère; their official defence commended the "new machines and means of military defence" perfected at Meudon. .... that our former leaders requisitioned the bodies of the guillotined, had them taken to Meudon, had them flayed and their skins tanned, and that Barère and Vadier wore boots made from the leather of their miserable victims. The following issue explained that the skin from guillotined bodies had been used to make footwear for soldiers and that "the first trials of this new leather had been devoted to making boots for Saint-Just and Barère". No wonder, he adds, that the government had taken such precautions to prevent anyone from entering the site! 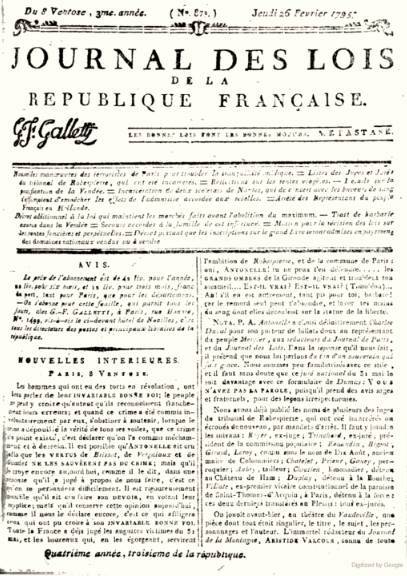 Galletti's key piece of evidence was the famous bookbinding belonging to Guillaume Villenave, now in the library of the Carnavalet. In an study published in 1872, the historian Louis Combes reproduced the text of a poster on blue paper which was sold with the book when it was auctioned in 1864. In it Galletti informs us that Barère and his colleagues had denied his charge - also by means of a "big blue poster", plastered all over the walls of Paris. He complains that he had been singled out for attack, even though he was not the first to make the allegations. If the tannery did not exist at Meudon, "it certainly existed elsewhere", since one of his subscribers has sent him a copy of the Constitution of 1793 printed in Dijon, chez Causse, and bound in human skin in imitation of natural calfskin (le veau fauve). It is a little suspicious to say the least that a book should suddenly be produced when all the other references are to trousers or boots. In all probablility Villenave, who was chief editor of Galletti's journal, orchestrated the whole episode; as Louis Combes observes, the only reason he would have wanted such a relic was as a confirmation of Republican atrocities. (Combes, "Les tanneries de peau humaine", p.22-23). Hopefully, the Anthropodermic Book Project will soon be allowed to examine the binding and we will know one way or another whether it is genuine human skin. In the present climate of poverty and shortages, we must commend as an appreciable achievement, the discovery of a method for tanning, in a few days, leathers which had previously required several years of preparation. At Meudon human skin is tanned and the production leaves nothing to be desired either in quality or preparation. It is well known that Citizen Philippe-Égalité wears breeches of this sort, the material taken from the finest bodies of the executed. The skin that comes from men is of a consistency and quality superior to chamois. That of female subjects is more supple, but it lacks firmness due to the softness of the tissues. A final element to the myth of Meudon, was the idea that the Revolutionaries dehumanised their victims to the extent of making the tanning of human skin into an industrial process. A certain Séguin, so the story goes, came to the Convention with a proposal for a new method of tanning and was set up at Meudon to process human hides on an industrial scale. What people in Europe does not dismiss as a fable the establishment of a tannery of human skin at Meudon? However, it might be remembered that a man came to the bar of the Convention to announce a new and simple procedure for preparing an abundance of leather; that the Committee of Public Safety (of Carnot) granted him a site at the château of Meudon, whose doors were carefully closed, and finally that Barrère, Vadier and others were the first to wear boots made of human hide.